Western diplomats and journalists fell for Stalin's show trials but eventually learned not to accept developments in the Soviet Union at face value. In the Soviet Union's later years, a crowd assaulting a foreign embassy would have been assumed to have state approval. Other autocrats engage in similar tricks and illusions. Indeed, it's often best to bring the U.S.S.R. to mind while trying to understand tyrannies. Specifically, that was the case concerning the Sep. 9 mob attack against the Israeli embassy in Cairo. Appearance: The attackers had participated in a demonstration by liberals/seculars in Tahrir Square, so the liberals were behind the assault. Or perhaps Islamists were. In any case, after some dithering, the military regime headed by Mohamed Tantawi protected embassy personnel and saved the day without any casualties, though the embassy itself was trashed. Conclusion: just as the West needed Mubarak, it needs Tantawi to fend off the Islamists. Reality: By way of background, when a young Egyptian climbed the building housing the Israeli embassy and replaced the Israeli flag with the Egyptian one on August 21, 2011, the regime responded by celebrating his achievement and giving him a free apartment. 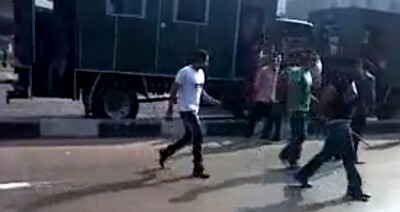 Screen grab of armed thugs leaving security service vehicles on their way to join a liberal/secular demonstration in Tahrir Square, Cairo, on Sep. 8, 2011. On Sep. 9, the liberals assembled in Tahrir noted thuggish contingents (known as the bultagiyya) getting out of security service vehicles and worried that these hammer-wielding toughs would attack them. Little did liberals realize that they provided cover for the thugs to march off to the Israeli mission and attack it. Police and army units stayed conspicuously away, leaving the embassy without security for hours, presumably told to allow the rowdies to attack. Finally, and only when things threatened to get out of hand, the regime intervened. What a brilliant move this was by the military leadership, bringing it no less than seven layers of achievement. The assault's anti-Zionist character won the military regime support from domestic Islamists. It discredited the liberal protestors. It permitted the military to defeat its internal rival, the prime minister, as suggested by his prompt resignation, followed by a sheepish return. It justified the possible return to martial rule, more complete than the one imposed by Sadat in 1981, as suggested by Information Minister Osama Heikal saying on television that the authorities will apply the entire emergency law. It put pressure on Israel to make more concessions to Egypt. It boosted Tantawi's standing in Arab/Muslim countries. It reminded the West that it needs Tantawi to fend off the Islamists.